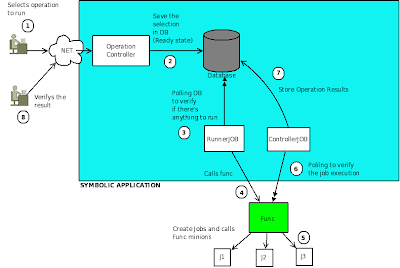 Symbolic engine, or OperationRunner, is something like what we have seen for the scripts: a couple of job/thread that going in polling over database, look for ready operation, or completed (success/failed) operations. All this operation will be completely asynchronous both for user and symbolic application: a ControllerJob will call each "n" seconds to verify the state of ran operation. An entry is stored in database and set in "ready state"
RunnerJob (is not the same job used to run scripts!) check, each "x" seconds, if there's any operation to run. User can see the result for the operation he called.